We've already gotten our first look at Chris Pine as Jack Ryan, and a couple shots of the Tom Clancy hero with Kevin Costner surfaced shortly thereafter. Now we have the first official still of our villain in action (or at least preparing to create some). Kenneth Branagh is featured looking rather dashing in this official photo, but he's probably plotting something dastardly. Of course, he's also the film's director, so maybe the set photographer was confused and caught him making a threatening phone call to the producer about not getting a cappuccino machine in his trailer. Just kidding, Branagh is far too classy for that. photo below! 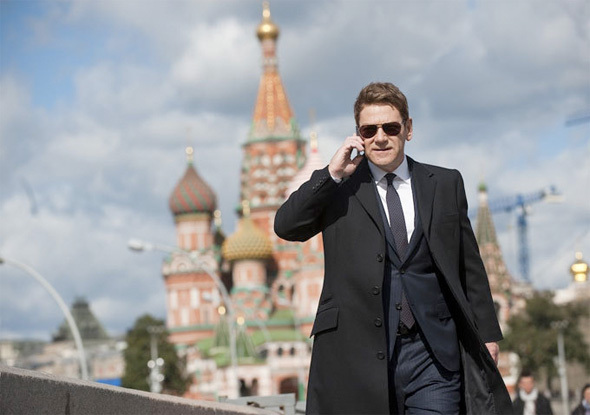 Kenneth Branagh is directing Jack Ryan with a script written by Steven Zaillian, Anthony Peckham, Adam Cozad and David Koepp. The film isn't adapted from a particular Tom Clancy novel, and essentially exists as an original story following Jack Ryan (who has appeared in films like Patriot Games and The Sum of All Fears) before he joined the CIA. Branagh is also playing the villain with Keira Knightley as the love interest, Kevin Costner as Ryan's mentor, and James Earl Jones maybe reprising his role from previous Tom Clancy adaptations. The film is now shooting and Paramount sends Jack Ryan to theaters December 25th, 2013. They should do this with all the publicity shots for this movie. Just actors doing very low key things that most people do in their everyday lives. Of course, how else will we know when the trailer is supposed to come out?